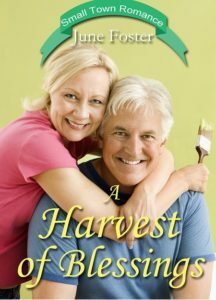 Finding a cover for A Harvest of Blessings was a challenge. I needed a middle aged couple who were involved in something they did together in the story. I found pictures of couples biking, hiking, and partying. Since Nadia and Jared didn’t do any of that in the novel, I couldn’t use them. Other pictures showed happy couples involved in different projects, but the guy and the girl weren’t the right age. Finally, persistence paid off. I found a picture of a couple painting a house. Yea! One Sunday afternoon, Jared rounded up some paint he’d stored in his shed and arrived at Nadia’s house armed with a drop cloth, paint brushes, and the paint. Together the two of them got a few walls painted. Only thing, they painting a couple of walls only scratched the surface on the needed repairs. One other problem: Jared had a hard time concentrating. He couldn’t take his eyes off Nadia.